Need some new mess tin Ghunga-Din? Want a “Jerry can” close at hand? Like a “flimsy” to use at your whimsy? Well Bronco has just such a set in 35th scale injection moulded plastic for you and we thought we would put it together to see what it is like. Often British AFV’s, vehicles and figure sets get a short shirt of accessories and stowage as they are the little brother of interest areas when it comes to popularity behind German, Soviet and American models. Recently though it has been great to see the Brit gear gets some good “love” from the manufacturers. Several very British and commonwealth subjects need some equally British stowage and containers. Now Bronco has released a set of new injection moulded stowage and containers of every kind. We thought you could appreciate them made up rather than just on the tree. Modellers really would love to create dioramas with multiples on this scale - so sets like this are in demand..
Physically this kit comes in a long open ended box revealing a plastic bag with twelve small sprues of injection moulded plastic, a decal sheet and a photo etched sheet. Instructions and paint call outs are on the back of the box - they are simple to follow and the paints listed are in the regular types most modellers use. These three sprues in total are filled with a few different things - six 'flimsies', six enamelled mugs, three buckets, three short bladed axes, three picks, three spades, three lamps, three funnels and lastly three pressure stoves with their mess trays. These mess trays use the supplied photo etch to make handles which can be opened or closed for stowage. The small square “Flimsies” were a real problem in real life for the Brits and their allies. They leaked more than they delivered in real life and the best use for them was often as a “Benghazi boiler” stove to cook in. These proved to be a little problematic to put together as they need to be set one corner at a time. I rushed in and got mine a little messy. This can be fixed easily though with some light sanding and maybe a little smoothing with liquid glue. I thought I would show you how they are without a clean-up – not that bad really - glad they looked damaged in real life as well! Sprue B consists of three times three boxes of single six pounder ammunition – these nine shell boxes have some fine writing on them. They go together with some care as there are six parts to each and the cases are only small – you have to take some time with these if you don’t want giant fingerprints on them! Otherwise these cans are covered with detail which can be weathered up nicely with paint. 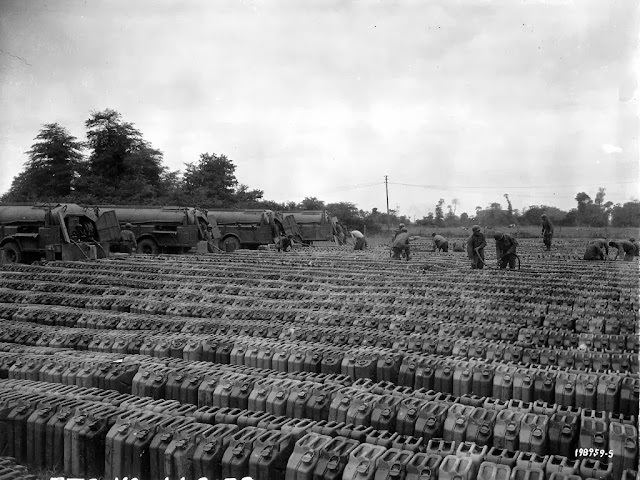 These three sprues represent the pinnacle of fuel containers – an idea invented by the Americans - pinched by the Germans and pinched back by the British. Eighteen British Jerry cans are the subject here. Complete with closures (open and closed) and a funnel for each sprue. You can clearly see the “WD” and 1944 markings on the front of these cans - British Had the "W D” (War Department) with an arrow facing upwards in-between them as well as the year of manufacturer below them – three cans are dated as “1944” so that kind of limits things for using them in an earlier diorama. To be honest though you cannot see this with the naked eye the detail is so fine so I think you might just get away with it with careful obscuring. These three sheets comprise of thirty small British two-gallon “metal” containers. These are made from two parts of styrene with a photo etch strip making their flat handle. These were called POL's - an acronym for Petrol,Oil,Liquid. 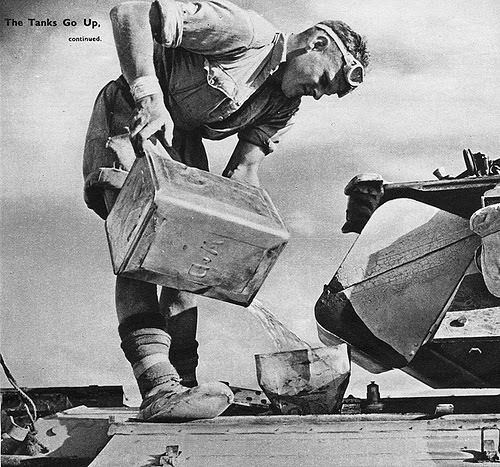 They were another unsatisfactory but widely used petrol transportation method for the Brits until the “Jerry Can” became the standard. On top the bottom of the cans you can make out writing on them. 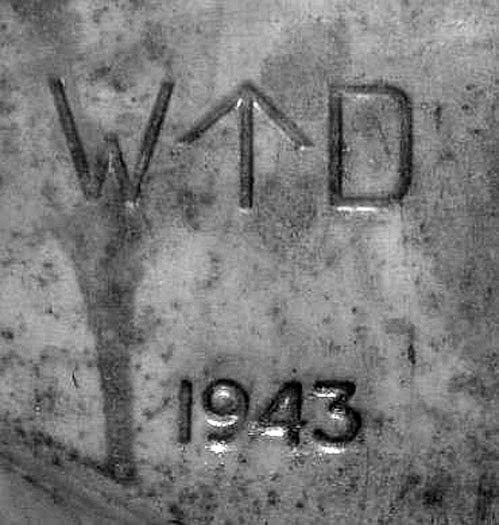 It is 'WD 1940 Petroleum Highly Inflammable' – whilst the other half are devoid of writing on the tops of the cans. The photo etched sheet here contains the thin centre seam for the Jerry cans, the handles for the “Flimsies” and the mess tins (folded closed and open). This sheet lends some scale authenticity to this set and the parts are really very easy to fold or in the case of the jerrycan – sandwich between to plastic parts that seal together thus holding it in place with the use of no superglue whatsoever. On the small decal sheet supplied with the kit you have all the lettering and stencils to add further reality to your new metal collection. Several “Water” and “W” decals along with “Petrol” in black and white. Yellow serial numbers as well. These are lacking in excess carrier film which is really important for small kits – you do not want half of the containers covered with silvering! Oops here are the plastic ones below - the real deal above. home run, this should sell well as there is a need for it in the market - or if i was british - and seeing it is a British set you could say modellers are "gagging for it".